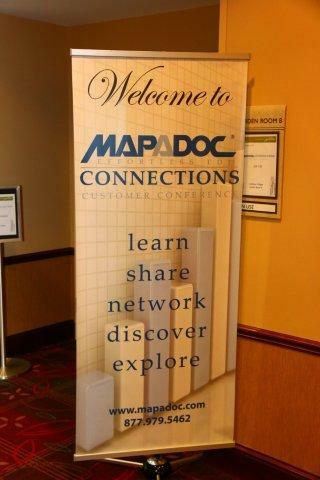 This being the second year of our MAPADOC Connections user’s conference, the connections made at the conference were tremendous. From a human standpoint, it was great putting faces with voices on the phone. From a consultant’s standpoint, meeting face to face builds a rapport that is lasting. From an end user’s standpoint, hearing how someone else deals with an issue that you are having is priceless. Here’s the inside view on why trade conferences like MAPADOC Connections are important to consultants like me. Meeting someone face to face that I have talked to on the phone is always interesting. The face never matches the mental picture that I build in my mind. Meeting in person allows me to have a greater understanding of the person when I talk to them on the phone. As a consultant, the rapport I built at MAPADOC Connections will really last. Me and the end users do indeed share something in common and it is my job to make life easier for my customers. Connecting with you by talking on the phone and being hooked in to your business systems all day long is great but when I get to meet you face to face, it takes our relationship to a whole new level. I look forward to lasting friendships, all due to the relationships I built and solidified at MAPADOC Connections. Okay, enough about me. What do YOU get? As an end user, MAPADOC Connections allows you to meet others who have dealt with the same challenges that you are dealing with now. This is really the best part of MAPADOC Connections. When you get to see and hear how someone else has handled the challenges you are facing, it opens your understanding to the many ways you can approach those challenges. Problems and solutions can be as simple as solving a pesky data-entry problem or as revolutionary as making you re-think how your process works. I saw several of these types of user-to-user connections developing right before my very eyes at this year’s conference. Should you go to MAPADOC Connections? When asked by my customers if it is worth going to MAPADOC Connections, I always answer emphatically, “YES!” The connections that you make will be lasting, and you’ll gain knowledge, friendships, and understanding that will benefit you for years to come. I hope to see you at MAPADOC Connections 2015. Until then if you have any questions about MAPADOC EDI for Sage 100 ERP, Sage 500 ERP or Sage ERP X3 please feel to reach out to us today.